Non-root bridges need to find the shortest path to the root bridge. What will happen if we have a mix of different interface types like Ethernet, FastEthernet and Gigabit? Let’s find out! In the picture above we have a larger network with multiple switches. You can also see that there are different interface types, we have Ethernet (10 Mbit), FastEthernet (100Mbit) and Gigabit (1000Mbit). SW1 on top is the root bridge so all other switches are non-root and need to find the shortest path to the root bridge. Spanning-tree uses cost to determine the shortest path to the root bridge. The slower the interface, the higher the cost is. The path with the lowest cost will be used to reach the root bridge. In the BPDU you can see a field called root path cost. This is where each switch will insert the cost of its shortest path to the root bridge. Once the switches found out which switch is declared as root bridge they will look for the shortest path to get there. BPDUs will flow from the root bridge downwards to all switches. If you studied CCNA or CCNP ROUTE then this story about spanning-tree cost might sound familiar. OSPF (Open Shortest Path First) also uses cost to calculate the shortest path to its destination. Both spanning-tree and OSPF use cost to find the shortest path but there is one big difference. OSPF builds a topology database (LSDB) so all routers know exactly what the network looks like. 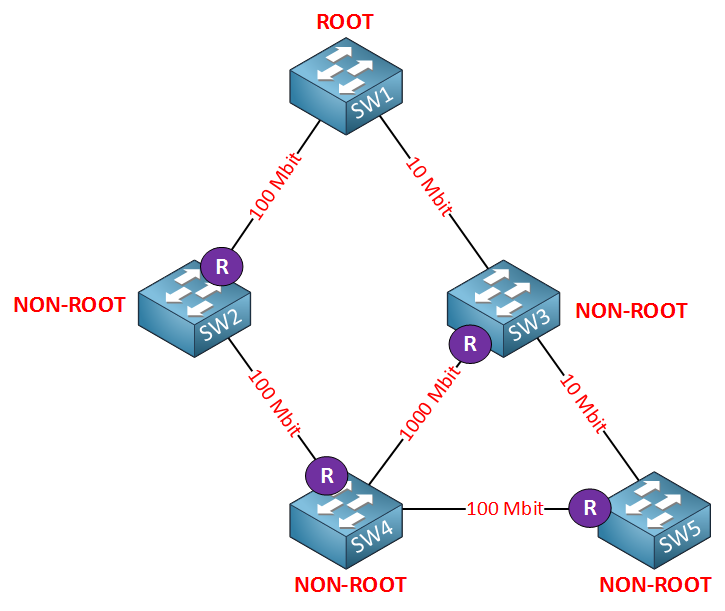 Spanning-tree is “dumb”…switches have no idea what the topology looks like. BPDUs flow from the root bridge downwards to all switches, switches will make a decision based on the BPDUs that they receive! SW3 will receive BPDUs on its 10 Mbit interface (cost 100) and on its 1000 Mbit interface (cost 4). It will use its 1000 Mbit interface as its root port. SW4 receives a BPDU from SW2 with a root path cost of 19. SW4 receives a BPDU from SW3 with a root path cost of 100. The path through SW2 is shorter so this will become the root port for SW4. SW4 will forward BPDUs towards SW3 and SW5. In the root path cost field of the BPDU we will find a cost of 38 (its root path cost of 19 + its own interface cost of 19). I am not clear about the root bridge. I mean why are we finding the root port(for non-root bridge) to reach the root bridge. Is it like in practical scenario, the root bridge is set as destination to one of the server?